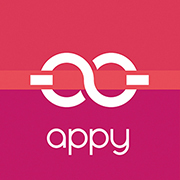 To log in, visit appycouple.com or your wedding website URL. The log in icon is in the top right corner of the page. Enter your email address and password to access your dashboard. When logged in from a laptop or desktop, the "Logout" icon will always be featured in the top right corner. After you download the app, click on "Join Wedding"
To view other weddings, log out and either join a new wedding or click "Your Invitations"